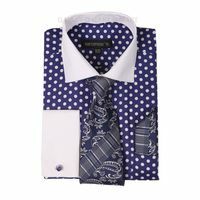 Mens dress shirt and tie sets have been a great way to look your very best when you're wearing a Double Breasted Suit and prefer not to stress over which dress shirt and tie matches what suit you're wearing. 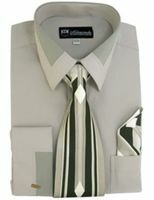 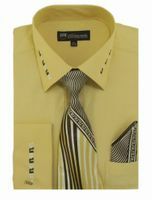 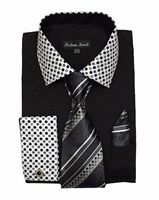 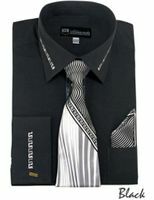 These versatile shirt and tie set have the bonus that a professional designer already did the footwork for you. 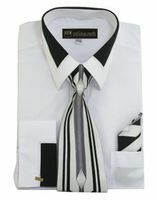 Did you know that ContempoSuits.com also sells Tuxedos too. 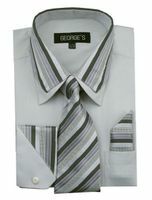 You should enormous variety of affordable priced Mens Suits. 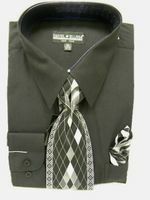 Don't Forget to Check out our selection of Stacy Adams Shoes. 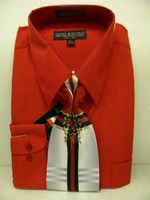 If you like Real Crocodile Shoes by Belvedere Shoes you can treat yourself. 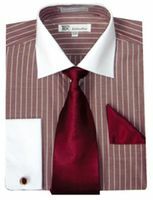 Have You Seen Our Huge Collection of Urban Men Suits Here. 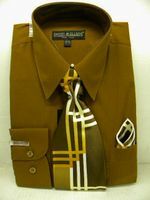 Have You Seen Our Great Selection of Genuine Crocodile Shoes Yet. 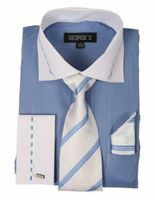 Once you start wearing these men's shirt and tie sets, you may find it hard to wear anything else. 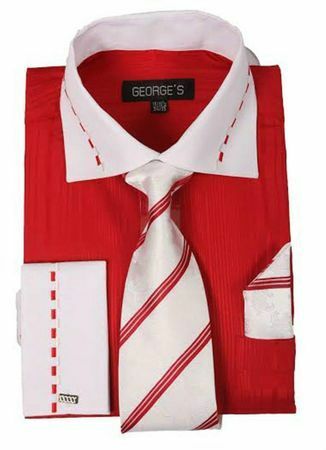 They are just that convenient. 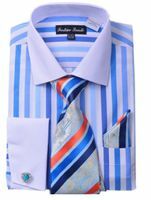 Daniel Ellissa French Cuff Dress Shirts offer unbeatable eyecatching Italian fashion style with exquisite quality at an affordable price. 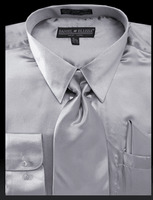 Daniel Ellissa French Cuff Dress Shirts are a fashion brand that won't break your budget. 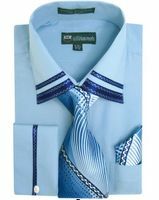 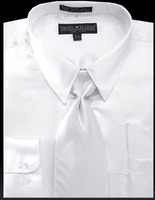 If you like avant guard style mens french cuff dress shirts, Avanti Uomo french cuff dress shirts are for You. 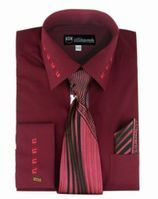 Featuring fashion attitude that certainly tells you that these great looking mens dress shirts are designed in Italy in the very latest shirt fabrics and pattern designed to make even the most ordinary mens suit pop. 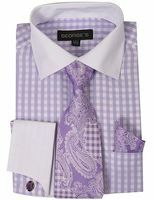 Italian style and attitude is what you'll recognize in each of these Fratello mens french cuff dress shirt and tie sets available. 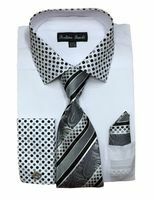 Featuring fancy spread collar designs that are combined with bold pattern fabrics with french cuffs for a dress shirt is just designed to get you noticed quick. 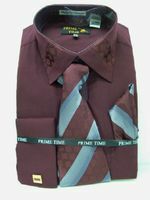 If you're shopping for fancy fashion style dress shirt and tie sets cheap, this is the place with one of the of the largest selections you'll ever find online. 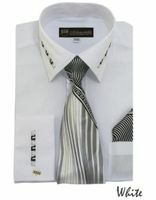 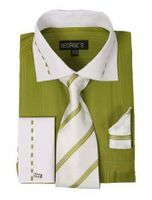 Fashion Dress shirt and tie sets are just what they are called. 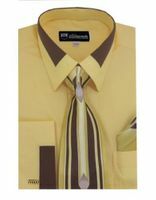 Nice dress shirts that come with a matching tie and hanky. 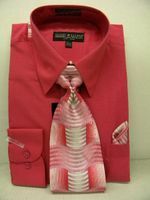 The reason I like selling them is that the customer doesn't need to think or figure out if the tie set combination will match the shirt because the designer has done that work already. 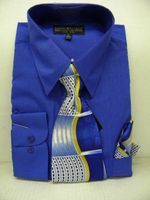 The Fashion Dress shirts that come with the matching tie sets that we sell come in a whole array of colors and styles from contrasting french cuffs and collars to solid french cuffs and collars. 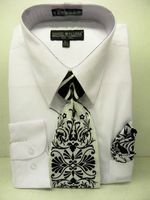 The collars and french cuffs may be solid or have embroidered designs on them all with a matching tie and hanky set. 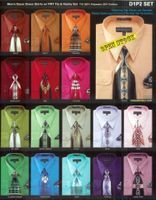 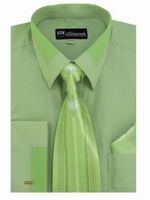 We sell fashion style french cuff dress shirt and tie sets cheap from many different brands and they are all very popular. 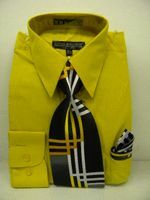 We have fashion dress shirt tie and hanky sets that run from a more conservative look to "hey look at me" flashy. 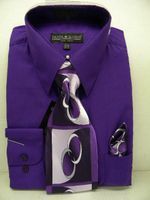 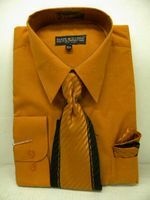 Fashion Dress shirt and tie sets also make fantastic gifts for the well dressed man as well because they are already prepackaged and ready to be wrapped in your favorite gift wrapping paper. 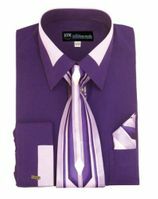 Dress shirt tie and hanky sets are always changing styles so you can always freshen up the look of your wardrobe with little cost.